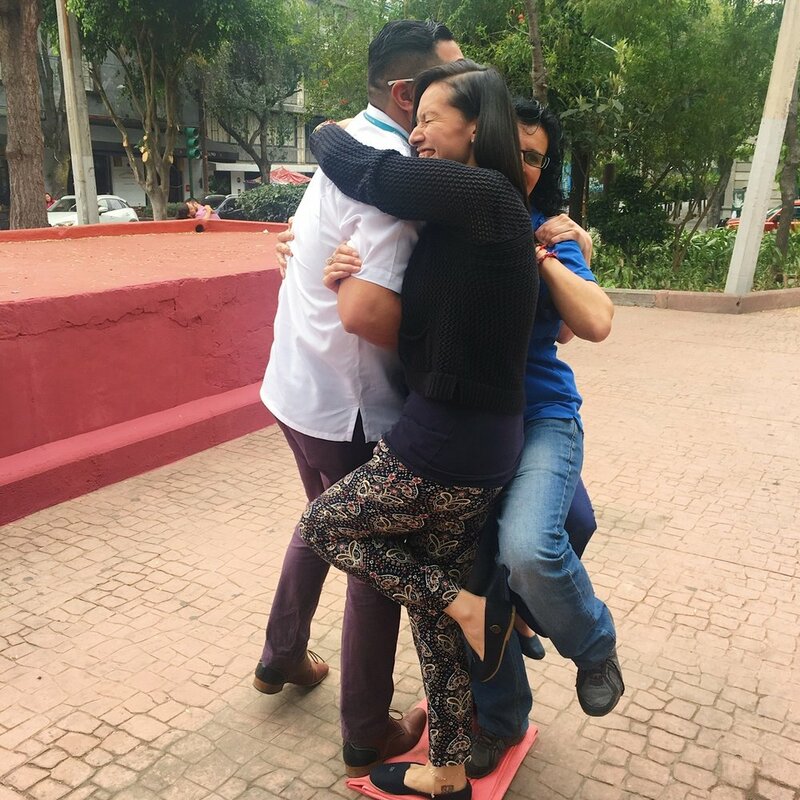 As a Design Thinking consulting for salauno, a social impact ophthalmology organization in Mexico City, I lead a design team of ten to grow employee engagement and solidify company culture. Salauno is one of the most successful startups in Mexico— they are among the most funded startups in the country, have received dozens of awards for their disruptive service model, and, most importantly, serve twice as many ophthalmology patients than traditional hospitals, and at an accessible price. Salauno is an intriguing mix: an eye clinic that scales like a tech startup, and is run by two former bankers. Pulling back the curtain in early 2017 however, the company was fighting its own battles. Salauno struggled with high turnover of doctors. Employees felt a dissonance with the impact-driven mission and the pressure they received from managers to meet sales KPIs. And with a recent investment, salauno was doubling the size of its operating capacity, building a brand new hospital to open in July of 2017. This meant that employee retention, performance, and engagement were more important than ever before. I arrived in Mexico City at two in the afternoon in early March of 2017, and by four was at work planning the next four months with the internal project leader, Daphne. There was no time to lose and much to be done. The next day was showtime. Daphne had already recruited 10 salauno employees to be a part of the design team, and every department was represented: doctores, nurses, corporate, clinic managers, and HR. The first step was user research. As the design team was made up of employees, we first needed to help the internal team identify their own biases and opinions regarding the current salauno employee experience. It was great to have peers interviewing one another, as the trust and empathy came more naturally to both, but it was crucial that the members of the design team didn’t manipulate the research to align with their own personal wishes and feelings. We utilized two main research methods, and complimented them with some external inspiration. IMMERSION / OBSERVATION : We started out simply watching. We observed the entire patient customer journey, from the front desk to eye exams to the surgical theaters. This was a great way to begin gathering initial hypothesis about the pains and gains of those working in each station. An interesting insight came in the operating rooms: each had music playing, and as we later learned, the doctors and assistants had an organized method of whose turn it was to chose the playlist. The medical professionals hummed, sang and even bopped along with the music together. Our hypothesis? Music balances the stress of the highly risky activities, bonds the team, and adds a little fun in the day. INDIVIDUAL INTERVIEWS : We emerged from the observation phase with plenty of questions. These went into our Interview Guides we designed to use in sit-down sessions with people from all over the company. We traveled to different clinics, balanced various shifts, and in the end met with over 40 employees. While most of the questions were conversational, we did use a card sorting activity with the doctors to establish some clearer boundaries about their desires and frustrations in salauno. EXPERT INTERVIEW : When researching the leaders in work culture and employee experience, Google emerged as a clear expert. So, we went to Google! Myself, Daphne, and three other members of the design team visited the Google Mexico City offices and took a peek into the hiring and on-boarding process with the leader of Human Resources. We got a tour of the incredible space, and spoke with an employee about her time as a Googler. Overall, it was an inspiring morning that expanded the internal team’s vision of possibility in a work environment. ANALOGOUS CONTEXT : Continuing with the idea of learning from others, Daphne and I set out to find a workplace with similar constraints and realities as salauno: a high-stress environment with a large dependency on collaboration, where employees deal with sensitive, even dangerous processes, and where customer interaction is a huge part of the day. We determined employees in that high-caliber restaurants would face very similar conditions, so we spent an afternoon at an Olive Garden (Note: In Mexico, Olive Garden is fancy, its Yelp review would have three dollar signs, and its a place you go to celebrate a special occasion). Admittedly, we ate lots of breadsticks. But we also got a look at the tedious standardization and organization in the kitchen. We learned about their employee recognition program, the education programs, and customer service policies. I enjoy Analogous Context sessions because it helps the participants find surprising insights, and, in this case, it had to do with the sticker board. Olive Garden managers made a poster for with a line for each employee, where individuals would put stickers in the boxes for meeting their daily goals. It was a visual celebration, and every Olive Garden employee praised it. It was reminiscent of kindergarten, but it was an easy way to reinforce small accomplishments, a fun way to make employees feel like their contribution was recognized, and was a public way to view overall company performance. Sometimes going back is the way forward. GROUP INTERVIEW : We held an unusual group interview for the doctores to suss out some tactical preferences about benefits. As each doctor entered the conference room, they were handed $1,000 pesos in (well, in Monopoly money). On the table were categories of existing and potential benefits and their cost per month written on colorful index cards: paid vacation days (broken down per day), private medical insurance, medical insurance through IMSS (public system), savings account, aguinaldo (Christmas bonus), subscription to medical journals, and financial aid for medical conferences. Each person was told that they could spend their $1,000 on themselves however they liked. We listened in as doctors talked amongst themselves and observed their decisions as we asked them to think aloud in the process. After 10 minutes, we facilitated a group discussion to come a mostly unified conclusion of how the $1,000 pesos per employee should be spent. We then revealed that in fact, $1,000 per employee per month is exactly the budget that salauno had to spend on each doctor. It was then decided that we would launch an exploratory 3-month trial for the benefits the group chose. This exercise proved to be a successful way to provide transparency to the medical staff, have them realize the difficulty in prioritizing and budgeting, and helped them unite as a team. Our internal design team got invaluable insight into mindset and values of many of the doctors, and came away understanding them even more than we did after the individual interviews. After really understanding our users, five compelling How Might We’s began to emerge to continue us along in the journey. How might we make employees feel ownership over rules and changes? // ¿Cómo podríamos hacer que la gente se sienta dueños de los cambios y las reglas? How might we generate a culture that prioritizes development and growth? // ¿Cómo podríamos generar una cultura que prioriza el crecimiento y desarrollo? How might we create a foundation of wellness in our employees? // ¿Cómo podríamos crear una base para el bienestar de los colaboradores? How might we create empathy between colleagues to support one another? // ¿Cómo podríamos crear empatía entre compañeros para que se apoyen entre ellos? How might we elevate salauno from employer to an enabler of people's life's missions? // ¿Cómo podríamos elevar salauno de un sencillo empleador a un facilitador de tu misión en la vida? So many important insights emerged, that we felt it necessary to define three realities that would ultimately inform the solutions. The internal design team during a renditin of the six hats brainstorming exercise. I believe embodiment makes the game that much more effective! ideation | After determining our project mission more clearly, we dove into ideating as a team. We played all types of brainstorming games, voted with colorful dots, all wore plenty of hats--both figuratively and literally! All in all, 10 strong ideas emerged for prototyping. Service Design prototyping is always a fun challenge. One interesting idea from ideation was a super cool break room, free from the view of patients. 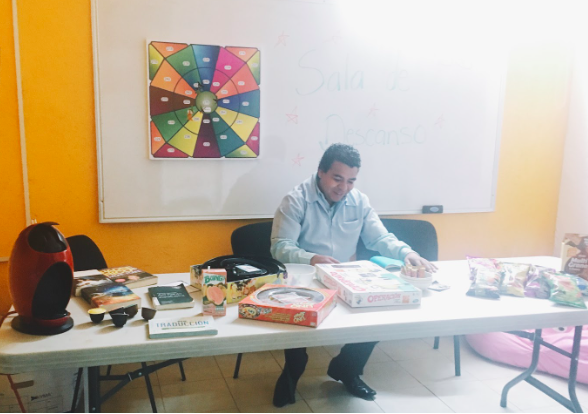 We turned an existing conference room into this “Sala VIP” for a day, with board games, snacks, books, essential oils, and a bean bag. Then, we took turns observing what users took to first and for the longest time, measuring body language and asking participants to leave a comment with a smily or sad face on a poster hanging on the door. The relaxing elements like the bean bag, books and oils were the most popular, though most people visited with coworkers, so the space became more social than we expected. We also imagined a passport-like document where you could request “visas" to visit different areas in salauno and earn stickers while going “around the world.” The idea was to encourage interdepartmental immersion and empathy, while deepening employees’ understanding of the holistic salauno operation. We prototyped the physical passport out of paper and hand drawings, and invited 6 employees to take part in “a day in the life of” exchanges, spending two to three hours in areas outside their own. Coordinating times between managers and employees proved tricky, but we received positive feedback about the idea of areas “opening up their borders” so people could learn more. The most difficult idea to make tangible was the the concept of a “change kit” to be gifted by managers to teams before big policy changes. In our research, we found that employees felt beaten down by the seemingly constant barrage of corporate changes, from schedules to metric goals, uniforms to medical processes. It was unrealistic to believe that salauno would ever be done evolving, so instead the team thought there could be a way to make the big changes easier to handle and feel more purposeful. The Change Kit concept was intended to separate a time for explanation and questions, provide a small physical gift to help with the adaptation, and put the change in perspective. Our prototype experience was for a change in the nurse’s schedule, where all morning shifts for nurses would be bumped up two hours earlier. This would require people to get up earlier, but would allow for more patients to be served. In the prototype, the manager explained the change and the nursing team had a light discussion. She mentioned predictions for how many more patients would be helped over the next year, comparing these numbers against the long-term company goals. Then, the manager gave each nurse a little packet with instant coffee and an updated written agenda. She thanked everyone for their commitment to salauno and its mission. The feedback on this experience was undeniably positive: users really liked the thought of the gift, and appreciated hearing about the future impact the change would have. It was a small event, but proved very popular. "Refresh Moments" and “Splash” are opportunities for building empathy company-wide. Refresh Moments stated that ten percent of any team-wide meeting must begin with an ice breaker for the team to get to know one another better. We asked our internal design team to implement some trials in their meetings over a two-week span and report back. At first, meeting attendees were a bit annoyed at what was a perceived as a waste of time. But as the ice breakers became an expected part meetings, they were embraced by most everyone, and reduced distractions in the rest of the meeting. The “Splash” however, proved impossible to execute. The idea was to invite a diverse selection of employees to participate in a 30-minute team building every week, sponsored by the HR department. While people enjoyed participating, managers found it difficult to lose team members at random times during the week, and it was indeed hard for the HR department to keep the activities fresh. The final prototype was for Familia VIP, a proposal to engage employees’ families. This consisted of several activities: family tours of the facilities, family lunch buddies, and special yearly events. In our research, we found the majority of salauno employees felt motivated by Salauno’s service-based mission, and loved sharing this with their loved ones. My mom happened to be visiting Mexico City the week we were prototyping, so she and another employee’s fiancé joined us for a special tour and a lunch in the salauno cafeteria afterwards. Upon arrival, they got a special family visitor badge, and the high-level tour touting salauno’s accomplishments was given by an HR representative. The four of us lunched together afterwards, and I left the meal feeling much closer to the salauno employee, and proud that my mom could see what I had been working on the past three months. We got We received similar feedback from others who participated in the tours and lunches as well. After 15 weeks of work, five final concepts were implemented, with a special Change Kit scavenger hunt activity launching the new incentives at the grand opening of the new hospital. SALA VIP : Employee space for privacy, play, and rest. PASAPORTE SALAUNO : Discover the world of salauno! Gamification of continued learning and team support. Employees document cross-training experiences in different departments called In Someone's Shoes ("Ponte en los Zapatos de"), earn points for "echando la mano" or helping out a team member, and have 3 hours per month of gifted company time to develop in an area outside of work. KIT DEL CAMBIO : Physical and experiential practices to ritualize the frequent change in salauno. Every time a change is implemented that impacts more than five people, the team leader performs a memorable activity to emphasize and memorialize the change. Leadership will also hold a quarterly all-hands meeting with Q and A.
MOMENTOS REFRESH : Best practice that 10% of a team-wide meeting must begin with an ice breaker as an opportunity for building empathy. FAMILIA VIP : Several initiatives to involve family members in employee's professional lives, including family tours of the clinics and hospital, annual Family Day carnival, and invitations to weekend campaigns in the field. This project was extremely rewarding, both as a designer and researcher, and as an advocate of social impact. However, it was a tough four months. I learned the importance of returning to the project purpose again and again. In this case, that meant reminding myself and the internal team of the company mission. I am proud to say that the project gave the salauno team and leadership a toolkit to return to and continue iterating upon, and that salauno’s investment in the employee experience helped shape the success of the expansion. Everyone wants to belong (learned this in high school student government from my incredible advisor). Ritualizing positive behavior reinforces the behavior.